"Miniatures of the late King of Denmark and his Queen are framed as the surprise feature in the Imperial egg. The outer surface is in light blue and white enamel with ornaments in gold and precious stones. On the top are the armorial bearings of the Danish Royal Family, and it is supported by Danish heraldic lions." This is one of the biggest Imperial Easter Eggs to have been made, and was created to celebrate that the Dowager Empress - Danish born Maria Feadorovna - returned to Denmark for the 40th Anniversary of her father's accession to the throne in 1903. In 1904 and 1905 no eggs were made. 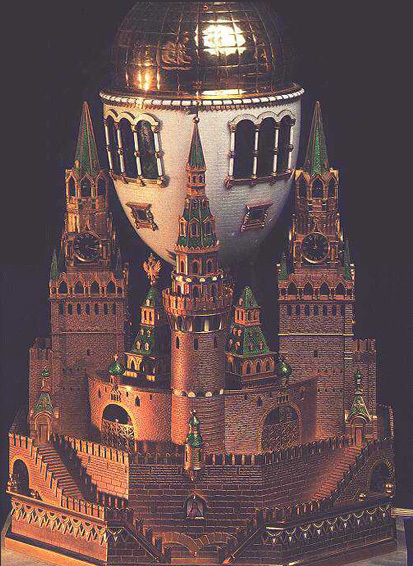 But in 1906 came the "Moscow Kremlin Egg", or the "Uspenski Cathedral Egg"! This is the largest of the Fabergé eggs, inspired by the Cathedral of the Assumption (Uspenski) in the Moscow Kremlin. This cathedral is where all the Tsars - including Nicholas II himself - were crowned. Flanked by two circular, and two square turrets, sits the dome of the Cathedral of the Dormition in white opalescent enamel, topped by a gold cupola. The interior of the church, with its carpets, tiny enameled icons and High Altar on an oval glass plate is made visible through four triple windows. 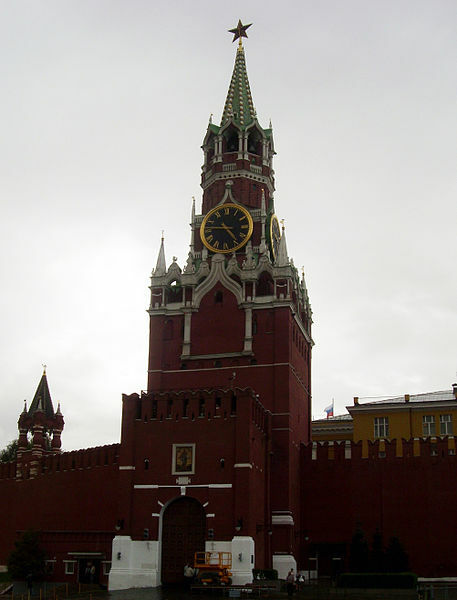 The square towers are based on the Spassky Tower, bearing the coat-of-arms of the Russian Empire and Moscow, and inset with chiming clocks (1,2 cm in diameter). The whole thing is standing on a crenelated gold base and an octagonal white onyx plinth, signed "Fabergé " and dated 1904. The walls of the cathedral are decorated with tiny enameled icons of Our Lady of Kazan and Christ Pantocrator. 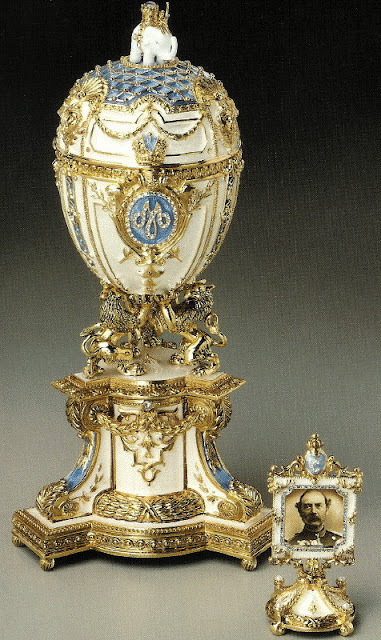 The surprise in this egg is a clockwork music box with its original gold key at the base of the egg. The music box plays "Izhe Khveruviny" ("Cherubim Hymn"), a favorite hymn of Tsar Nicholas II. This egg commemorates the return to Moscow by the royal couple Nicholas II and Alexandra Feodorovna in 1903. They had been avoiding the capital since a riot broke out during the coronation of Nichols, that killed hundreds of Moscovites. As the date 1904 - engraved in the base of the egg indicates, this was the year the egg was to be represented, but this was delayed because of the Russo-Japanese War (1904-1905), and the assassination in the Kremlin of Nicholas' favorite uncle and brother-in-law, Grand Duke Sergei Alexandrovich. So instead the "Moscow Kremlin Egg" was delivered in 1906. Despite - or maybe because of - these sad memories, this egg was kept in Alexandra Feodorovna's own Mauve Sitting Room in the Alexander Palace. This is so seriously majestic and suave looking I can't help but love it. Vilka vackra! Det är så trevligt med dina fabege-fridays, man vet att det är fredag och får intressant läsning! Like!